The two Dutch skippers in the 2017/18 Volvo Ocean Race will lead their teams into battle in a match race at the final stopover of the race, in The Hague. 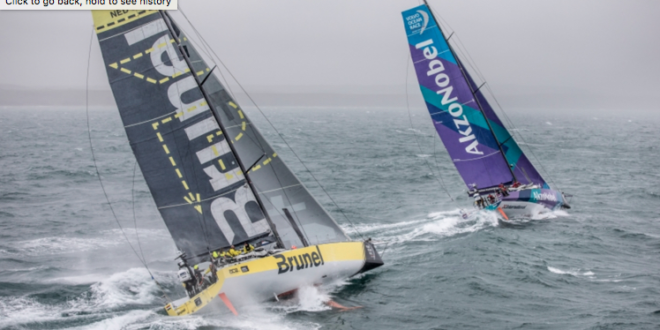 Team AkzoNobel and Team Brunel, the two Dutch-flagged rivals in the Volvo Ocean Race, are to face off against each other in final friendly duel at the race’s ultimate destination, The Hague. On June 27, 2018 the two crews will compete in an exhibition ‘match race’ series on their home waters in front of what is expected to be thousands of Dutch sailing fans. With eight of the race’s 11 legs completed, the Spanish team MAPFRE are the current leaders, ahead of the Chinese syndicate Dongfeng Race Team in second. Team Brunel, led by Dutch skipper Bouwe Bekking, sits in third – six points ahead of fellow-Dutchman Simeon Tienpont’s team AkzoNobel crew.